Janet L. Yellen took office as Chair of the Board of Governors of the Federal Reserve System on February 3, 2014, for a four-year term ending February 3, 2018. Dr. Yellen also serves as Chairman of the Federal Open Market Committee, the System's principal monetary policymaking body. 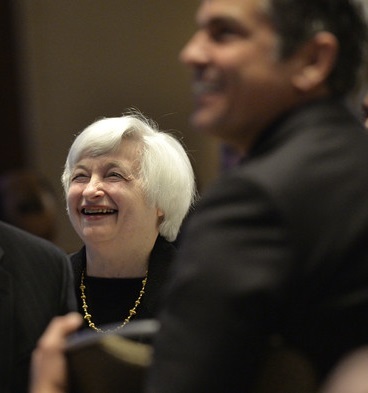 Prior to her appointment as Chair, Dr. Yellen served as Vice Chair of the Board of Governors, taking office in October 2010, when she simultaneously began a 14-year term as a member of the Board that will expire January 31, 2024. Dr. Yellen is Professor Emeritus at the University of California at Berkeley where she was the Eugene E. and Catherine M. Trefethen Professor of Business and Professor of Economics and has been a faculty member since 1980. Dr. Yellen took leave from Berkeley for five years starting August 1994. She served as a member of the Board of Governors of the Federal Reserve System through February 1997, and then left the Federal Reserve to become chair of the Council of Economic Advisers through August 1999. She also chaired the Economic Policy Committee of the Organization for Economic Cooperation and Development from 1997 to 1999. She also served as President and Chief Executive Officer of the Federal Reserve Bank of San Francisco from 2004 to 2010.